← Why A Cooking Blog? One of the fondest memories of when I was younger is my aunt making me and my cousin cinnamon sugar toast. I know that “it’s simple” to put butter and cinnamon sugar on toasted bread, but she always made extraordinary toast. It was ridiculous. Therefore whenever I find a recipe that calls for a spin on this delicacy, I jump on it as fast as I can. This recipe makes cinnamon sugar muffins that are also stuffed with Nutella. I ended up making two Nutella muffins and the rest I filled with Biscotti Spread from Costco. (It tasted like cinnamon peanut butter). 2. Spray muffin pan with cooking spray and set aside. 3. In a mixer, cream together butter and sugar. Mix in the egg, vanilla extract, milk, flour, baking powder, cinnamon, nutmeg, and salt. 3. Spoon 1 heaping tablespoon of batter into muffin cavity (no muffin cups required). Layer with 1 tsp Nutella in the center and spoon another heaping tablespoon of batter on top. If the muffin tins are completely full, that is ok. They will not overflow. 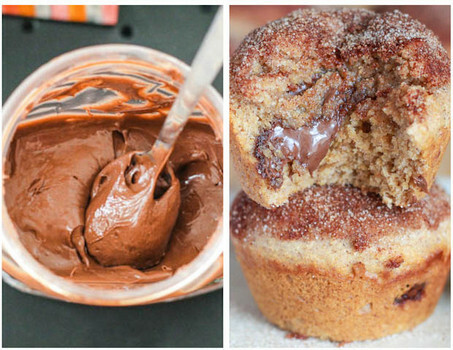 Repeat layering batter + Nutella into each muffin tin. I got exactly 8 muffins. 4. Bake at 425F for 5 minutes. Reduce oven to 350F and bake for an additional 13-17 minutes until batter is set. Allow muffins to cool for about 5 minutes. 5. While the muffins are cooling, make the cinnamon-sugar topping. Melt the butter for about 30 seconds in the microwave. Stir and stick back in microwave if not fully melted. In a separate small bowl, stir together the sugar and cinnamon. Dip the top of each muffin into the melted butter and dip into the cinnamon-sugar mixture. Swirl them around in the cinnamon-sugar a bit to make sure you get a thick coating. Set upright on cooling rack. Enjoy! Thanks to Sally’s Baking Addiction for the awesome new recipe. No thank you to whoever ate all my Nutella (probably me). LOVE these muffins! So glad you made them. They are one of my favorites for sure!